Picture this – you are working away developing a PowerCLI script that is performing multiple actions – you have it just about complete when you come to a roadblock. After frantically googling around you find out that this one task you are trying to perform simply cannot be done through PowerShell, yet you know it exists within the local ESXi esxcli command namespace! This has happened multiple times to me and thankfully, there is a way to access ESXi’s esxcli command namespace without having to leave the comforts of the PowerShell Console. Chances are that if you have been working at all with ESXi you are familiar with the esxcli command – but for those that aren’t let’s take a quick look at what exactly it does. 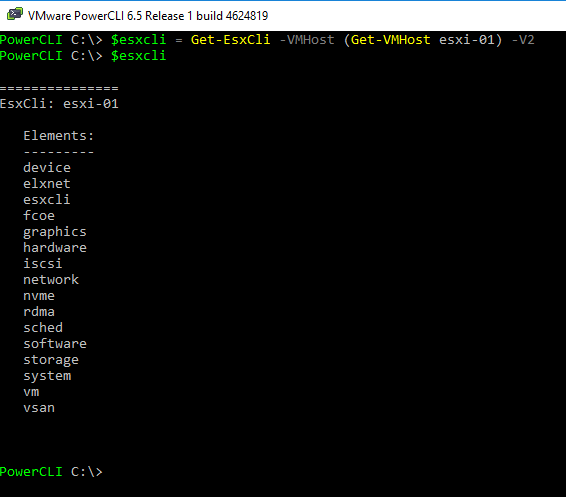 Esxcli is VMware’s answer to doing almost anything locally within the ESXi shell. Whether you are looking to install software, configuring vSwitches, setting up firewalls or multipathing storage esxcli can do it. 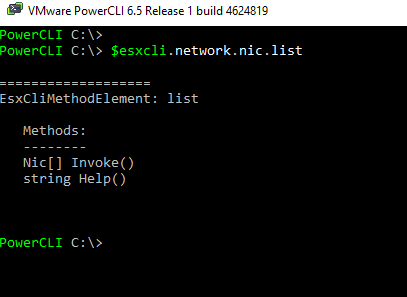 esxcli works much like a command line interface might on a network switch, where you start by entering an element and then continue to break down that element into different sub-elements or functions. All esxcli commands will begin with esxcli <namespace> ….. Before we move into how we get access to the local command let’s first take a look at what namespaces are available to us through esxcli within ESXi 6.5.
elxnet – commands related to managing the elxnet nic. graphics – commands related to the graphics capabilities of our devices, hosts, and VMs. hardware – commands related to the hardware installed on our host. iscsi – commands used to setup, configure, and troubleshoot iSCSI adapters and targets. rdma – Commands pertaining to Remote Direct Memory Access on the host. sched – commands related to scheduling related components within the vmkernel. software – commands used to install and remove software components on our hosts. storage – commands used to create, configure, and manage our storage. system – commands for configuring the core system. vsan – commands related to setup and configure VSAN. So, as you can see esxcli covers off just about function we can think of that we might need to perform on our ESXi hosts – but how do we gain access to this local command via PowerShell or PowerCLI. Once we have established a connection to our host we can then simply access the esxcli namespaces as if they were properties of the $esxcli object. Below, just by outputting $esxcli we can see the exact same namespaces as we discussed above. And at any time if you need help figuring out the syntax for the PowerShell version, we can simply just hit <enter> between elements. Below we can see what appears after we execute just the “.list” command that in order to fully execute the command we need to add the “invoke()” function. With PowerCLI supporting esxcli commands we now have the ability to script just about every possible scenario we can think of involving our ESXi hosts. No more spawning putty sessions or having to write expect scripts to get into the host to run local commands. Also, combining the information we can output from esxcli with the Export-CSV functionality of PowerShell we have a pretty solid start to pulling and displaying any type of reporting information we need to. If you want to learn more about the Get-EsxCli commandlet VMware has some fairly in-depth documentation around everything it can do here! Happy scripting and thanks for reading! PowerShell Modules – Why bother?